In a large bowl whisk together the remaining ingredients then add in the cubed chicken and toss to coat. Cover and refrigerate the chicken for 45 minutes to 3 hours. 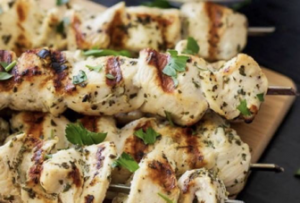 Thread the chicken onto metal or wooden skewers, be sure to soak wooden skewers for 30 minutes. Oil the grates of the grill or grill pan and place the skewers on them. Grill the chicken for 3-4 minutes then flip it over and grill for another 3-4 minutes or until the chicken is cooked through. In a medium sized bowl combine the remaining ingredients and whisk together. Fold in the cucumber and refrigerate until ready to serve.